I can’t remember the last time I bought a newspaper. Perhaps it was when I went on a long train journey. But when was that? Trains have become so expensive that it is nearly always cheaper to fly. I have a picture of myself at various points in time reading print newspapers and getting ink on my fingers. I remember how newspapers were enormous and how there was a knack to folding them so as to make reading manageable. But it isn’t as if I have stopped reading newspapers. I have a series of bookmarks on my browser. Each morning there are a few sites I go to. But when did I last pay to read anything? There was a time a few years ago when nearly every newspaper online was free. It all happened rather quickly. Suddenly something we all used to buy without much thought was free. Perhaps we didn’t buy a newspaper every day, but we did sometimes. But why pay for something that is free? It must have been at this point that I ceased to read newspapers made of actual paper. But this is our problem really, because nothing is free. Neither baby boxes nor newspapers are free. Someone has to pay. Newspapers are companies that pay staff to write. The people who write are called journalists. This is a job just like any other job. People may write for a living because they like writing, but they need to live just like everyone else. Would you do your job for nothing? Perhaps you would. But could you? How would you pay your bills? But how do free newspapers make any money to pay their staff? Well there are adverts. You may notice those things along the top of the page or down the sides. Perhaps you don’t notice, because you’ve got some sort of add blocker installed so that you are not bothered by ads. What a clever idea that is. It’s almost as clever as never watching the advertisements on free television. Above all we must make sure that we never pay for anything. That way it’s bound to stay free forever. Have you noticed how fewer and fewer online newspapers are free now? The Times hasn’t been free for quite a while. I can only read the odd free article, before they start asking me to pay. Fair enough. But do I pay? No I just don’t read the Times anymore. The Telegraph now has a subscription model too. I can read quite a bit on the site, but most of the comment section is behind a paywall. It’s a pity. I rather miss reading some of my favourite journalists, but do I pay? No. It wouldn’t really be sensible for me to pay, because I can find more than enough alternatives. Just occasionally I have a look at the Guardian. They don’t have a subscription yet, but they have a begging message at the bottom of each page. No doubt if that doesn’t work they will either go out of business or find some other way of getting readers to pay. The problem is that unless it is absolutely vital to me to read a certain newspaper or commentator I can always find more than enough alternatives. The BBC will always give me the basic news, dull and worthy, but more or less accurate. For comment I can go to sites like The Spectator or Reaction Life. If they started to charge, I could find any number of other sites. The begging bowl approach seems to work best where readers are committed to a cause. I think it must be for this reason that people sometimes make contributions to Bella Caledonia and Wings over Scotland. What are they paying for? What would happen if readers didn’t pay? The great thing about writing for the Internet is that it is completely free. Anyone can decide to set up an account for nothing. All they have to do is write. I have not paid one penny for any of my articles to appear online. Of course some people want to have a more special web address and that might cost something. But it isn’t necessary. So what are readers paying for? The begging bowl approach contains an implicit threat. If you don’t pay, then I will stop writing. But why should this motivate me to pay. If the best journalist in Britain told me that if I didn’t pay he would stop writing, I still wouldn’t pay. I’d just read someone else. Are Wings and Bella really the best journalists in Britain? What if there were no-one else who could possibly match the quality of the journalism written by the journalist asking me to pay? Under those circumstances I might think of opening my purse. But while I miss reading, for example, Ambrose Evans-Pritchard and consider him to be uniquely talented in his account of economics, I can make do without him. Could it be that Wings and Bella are more unique than him? I think readers to Wings and Bella are paying because they think it brings their cause closer. They are paying for independence. It’s a sort of instalment plan. Keep paying Wings and Bella and in time the cause will win. It must be something to do with the way they convert Pro UK people to support independence. Every time I read the intellectual heights that Bella reaches I find myself teetering on the edge of joining the SNP. If only Wings could write more than a paragraph, I would long since have painted my face blue. Just think I too could be soaring over Scottish politics. You only have to pay a small subscription and then there are the endless delights of joining that brave band of winged freedom fighters who bring independence ever nearer by their moral example. There is a certain objectivity about Wings over Scotland. The main task, of course, is to teach readers to think for themselves and without prejudice. Only in this way are they able to see through the veil of illusion that is spread by those who are conspiring against Scotland. If only there had been Wings at each crucial point in Scotland’s history, just like Blackadder, there would never have been a defeat at Flodden, the Darien scheme would have been a success and above all there would never have been those rogues joining us together with the Auld Enemy. Not that we have anything against this enemy of course. In fact he is our dearest friend and kind neighbour. Is it any wonder that people are willing to pay to see the truth. No-one else is offering this purity of reality. It’s yours for only a token gift each year. Not only do you get unique wisdom backed with the most prestigious qualifications, you get hope. It’s almost like going to church. There is the sermon and then there is the collection. Everyone leaves with a sense of belonging. Soon we will all reach the Promised Land. But for how long can all this be kept going? There is some uncertainty at the moment. I would pay quite a lot to know what Nicola Sturgeon really thinks and intends to do, but I doubt I will get that even if I were to read the Daily Record. I would like to know for certain that Theresa May will maintain the firmness of her response to SNP threats. I might even pay for that knowledge if you had an article beyond the paywall. But again like everyone else I will have to await events. Newspapers are no better at predicting the future than anyone else. If it becomes clear during the next year or two that there isn’t going to be Scottish independence any time soon, what happens to those to who pay to keep the dream alive? What indeed happens to SNP support in general? Does it depend on the emotion generated in 2014? 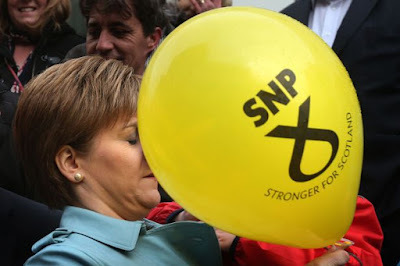 When you huff and puff into a yellow balloon with a creepy looking thistle on it there is liable to come a point when it goes pop. I’m finding that there is less and less to write about Scottish politics. We are a single issue sort of place dominated by a single issue party. We wait for the electorate to tire of the SNP and become bothered once more with day to day boring issues. It looks as if Bella recently looked down into the begging bowl and found it looked back at her. It must have seemed too to those given the gift of flight that the dream was so close that they could hardly fail to touch it. "Wings believed in the green light, the orgastic future that year by year recedes before us." But then so did Icarus. I have no special ability to predict the future and so have never expected my palm to be crossed with silver. I am pleased that my job is not journalism. When readers mostly expect to read for free it is unclear to me that such a profession has a future. It is better to have a job that doesn’t depend on generosity, but rather on necessity. It’s more secure to do something that people cannot do without. There will always be new computer games and the necessity for someone to tell the rest of us what they are like. 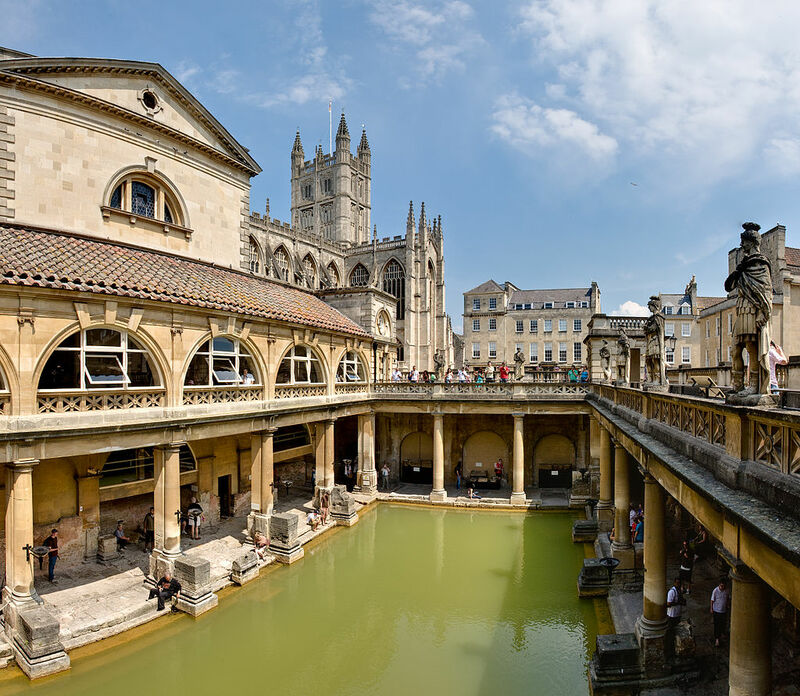 If that doesn’t work out I recommend living in a place where the plumbing is rather old fashioned and the baths so ancient they might have been used by the Romans. Keep reading for free. That’s what I do. But if you like to read good journalists its worth remembering that someone somewhere has to pay something. I don’t pay to read newspapers. I don’t expect anyone else to. But it might be worth occasionally clicking the adverts. You don’t have to actually buy anything, but without the clicks, eventually all newspapers are either going to end up behind the paywall or else nowhere. Probably you wouldn't pay to see N Sturgeons hand but I would Up the Kitty & Call. The Deck is almost gone with very few cards left to play & no doubt be found out & Fold her hand. Unfortunately someone with Lesser Skills will again Demand a better hand! Yes, sometimes you have to read between the lines of Newspapers & their headlines. However I think Scottish Liberals maybe called out & force an Election on us which I'm sure the Electorate don't want. What is really needed is for Libs & Greens to stop demanding a what's in it for us otherwise mentality & refuse to pass a budget that will bring hardship on the ordinary working propel . Like you I no longer buy the Times or Telegraph & search online for Rear balanced Reports and your Blog in particular. Thank you. How very enlightening. Or maybe not. I would pay you to stop writing.